Book of Sweet Taste. This is a Catalan recipe book. The surviving manuscript is from 1324 but it is thought to have been written during the 13thC. It is one of the oldest Christian documents on this subject if not the oldest. The author is unknown. Two copies survive today. One is in the University of Barcelona and the other is in the University of Valencia. 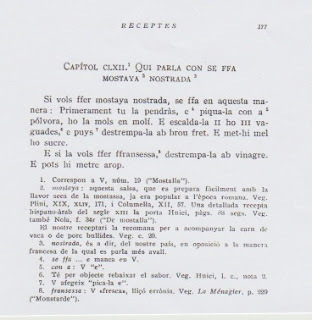 It has been maintained that this manuscript had the greatest impact on Medieval and Renaissance Mediterranean cooking and on Rupherto de Nola’s early 16thC Libro de Cocinain particular who repeats numerous recipes from the 14thC work expounding upon them in greater detail. 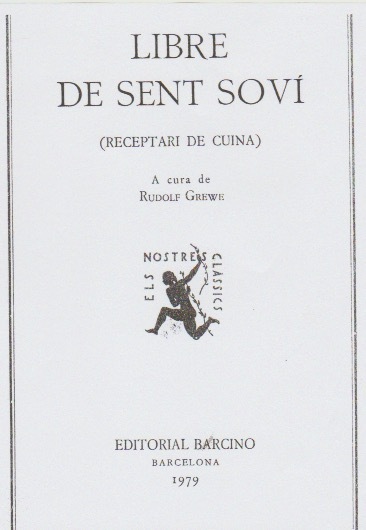 Further Sent Soví provides the first treatise on the art of carving as opposed to hacking meat as elsewhere in Europe, which lead to greater refinement in dining. With variations Catalan cooking continues to be based on Sent Soví with its wide span of recipes, flavors and culinary refinement. It is a composite of recipes of Arab origin such as pasta, rice, eggplant, almond milk, escabeche, sweet and sour dishes, nougat candy with found ing elements of the Catalan cuisine such as the picada (chopped food) and the sofrito (stir fried). It had fundamental influence on all Christian European culinary world especially in Naples, Sardinia and Sicily, Aragonese dominated regions in Italy, Languedoc and Provence in southern France and Castile. Grind mustard seeds into a powder. Temper it with bread soaked in broth. Add honey or sugar. If making French mustard, temper it with vinegar. Mustard prepared with dry mustard, which is hard to find today. If unavailable use French mustard. 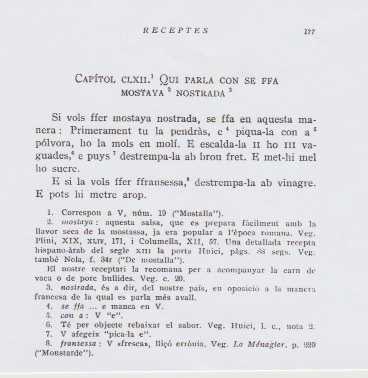 Mustard seeds were popular during the Roman period, see Pliny XIX, XLIV, 171 and Columella XII, 57. 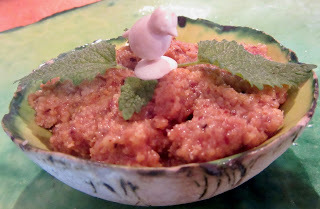 See Anón/Huici for a detailed recipe from the 13th C Al-Andalus era, #130 p. 88. Huici instructs that mustard seeds were ground with almonds and vinegar in which kebabs and other heavy fatty foods were soaked. 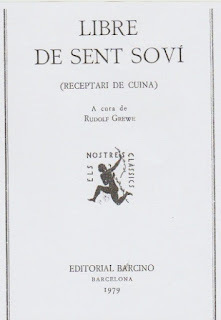 Sent Soví provides another recipe using “mustard, in Chapter 20, p 73 and lists“mustard” inthe first Apendix. Nola also provides a recipe for “mustard,” see l-1 and l-2., the process of which takes up to a year. Nola uses wine and adds cloves, ginger and cinnamon. Mustard was prepared by pounding it with a pestle in a mortar. See Nola 1-1 for instructions for preparing mustard and 1-2 for French mustard as outlined in blog titled “cantaro” published July 20, 2012. The mustard known today was not available until 1720 when a Mrs. Clements from Tewkesbury milled it like wheat. She then presented it to King George I, who loved it. Today, it is very difficult to find mustard powder for sale. Use the common mustard sold which is a cream if powder cannot be found or if one does not happen to have a mustard bush growing in his backyard!